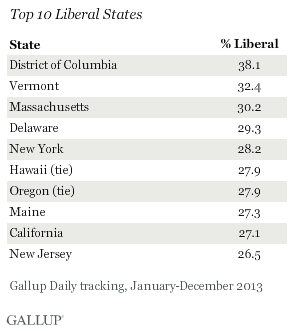 Which States Are The Most Condervative/Liberal? 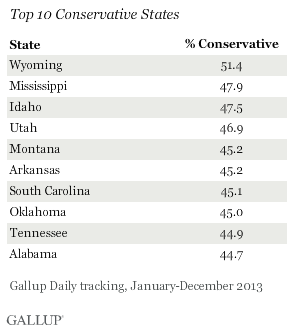 Which States Are Most Conservative/Liberal In US? According to an analysis by Gallup, "America has become a slightly more liberal and a slightly less conservative nation than it was in 2011 -- based on residents' self-reports of their ideology -- but conservatives still outnumber both moderates and liberals," More Americans continue to identify as conservative than liberal in 2012, 38% to 23%, compared with 40% to 21% in 2011. The percentage of self-identified moderates remains the same, at 36%. American Voters: Conservatve or Liberal? According to a new survey by Gallup, Americans are more than twice as likely to identify themselves as conservative as liberal on economic issues--46% to 20%. On social issues, the gap narrows, with 38% calling themselves conservatives, 28% self-describing as liberal. The nation is becoming increasingly friendly to the idea of gay rights and equality, as a recent Galup poll that measures attitudes about homosexuals serving openly in the military suggests: "Americans are six percentage points more likely than they were four years ago to favor allowing openly gay men and lesbian women to serve in the military, 69% to 63%. While liberals and Democrats remain the most supportive, the biggest increase in support has been among conservatives and weekly churchgoers -- up 12 and 11 percentage points, respectively." Gallup's analysis continues: "The finding that majorities of weekly churchgoers (60%), conservatives (58%), and Republicans (58%) now favor what essentially equates to repealing the "Don't Ask, Don't Tell" policy implemented under President Clinton in 1993 is noteworthy for several reasons. First, the data show that these traditionally conservative groups are shifting on this issue, supporting it to a far greater extent than they support legalized gay marriage. Second, it suggests the political playing field may be softer on this issue, and President Barack Obama will be well-positioned to forge ahead with his campaign promise to end the military ban on openly gay service members with some support from more conservative segments of the population. To date, it is estimated that more than 12,500 servicemen and servicewomen have been discharged under the policy, including more than 200 since Obama took office." For the third straight year, Mitt Romney has won the presidential preference straw poll of the Conservative Political Action Conference (CPAC) with 20% of the vote. Bobby Jindal finished with 14%, just ahead of Ron Paul and Sarah Palin, who got 13% each. Newt Gingrich finished with 10%, Mike Huckabee 7%, Mark Sanford 4%, Rudy Giuliani 3%, Tim Pawlenty 2%, Charlie Crist 1%, and 9% said they were undecided. The organization, which supports right-wing Republican values and candidates, is exceptionally conservative:95% said they disapproved of the job President Obama is doing, 80% "strongly disapproving.” Probably not significant enough to be taken seriously at this point, the CPAC straw poll is a notoriously inaccurate at predicting the eventual Republican Party nominee. In 1999, it awarded the straw poll victory to Steve Forbes. In 2005 and 2006, it went to George Allen, and in 2007 and 2008, to Mitt Romney. Will president-elect Obama make good on his promise to end partisan bickering in Washington? The answer may well determine the relative success or failure of his new iniatives, especially his effort to pass a comprehensive economic stimulous package. With little less than two weeks to go until the new president takes office, recent opinion polls suggest that Obama has made remarkable inroads with self-described "conservative" Americans: "The extent to which Barack Obama is experiencing a post-election wave of good will from Americans is born out by his base of supprt among these espondents: "close to half of political conservatives -- 45% -- say they are confident in Obama's ability to be a good president. About the same percentage (46%) disagree." The 45% who say they are confident in Obama contrasts with the mere 23% of this group who supported him over John McCain in the election. In the end, "this relatively strong endorsement from conservatives boosts overall confidence in Obama well beyond the 53% of the national vote he received on Election Day." Overall, upawards of 65% to 70% of Americans now say they are confident Obama will be a good president, while only 27% are not confident and 8% are unsure. PollTrack suggests that the higher Obama's approval numbers with conservatives (and Republican voters of all stripes), the easier it may be for him to garner cross-over support in congress for a range of initiatives. This support may well tunr out to be the political cover right-of-center politicians will need to support Obama's programs.